SlyOwl recently built a really cool, action-packed pirate diorama. It lit my fire! Bravo, very nice. An insane amount of bits in the roof sections but I liked the water splash, the stairs and the hidden pirate the most. If timed right, those canoneers might just hit that falling sheep! There’s a pirate hiding in a barrel! NINJAS AER BETTER THAN PIRATES!!!! Patrick, I think you mean your other right. 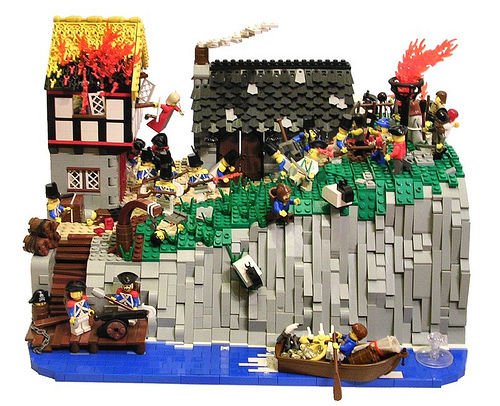 I hope all these pillaging dioramas are combined at a show someday.